The months keep slipping by but there is light at the end of the tunnel. All the dramas over the material have been rectified and Duncan is into it big time. It is great to see it finally come together and to get an idea of how the suede works with the leather, although I’ll reserve my judgement once a full panel has been done. 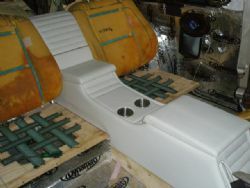 The rear console sitting between the two VZ buckets has been fabricated, massaged and trimmed and today was installed to allow for the massaging of the lower foam for the seats. Most of the alloy trim has been cut and moulded to the various panels and I sourced a new set of front door speakers to allow easy clearance in the panel. 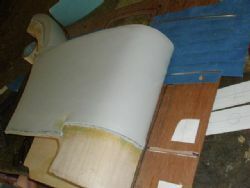 The rear side panels are taking shape and have been partially stitched up and the bendy ply is all in place. 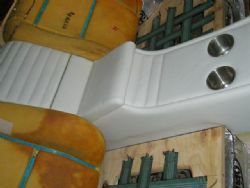 The moulding will continue through to the rear panels to please the eye and the same goes for the carpet strip along the bottom of the front doors and rear panels. Still yet to make a decision on the carpet but that will occur once a few of the panels are complete so we can determine what will work best with the colour scheme. All the plans are in place for the rear cargo area with more bendy ply to hide the rear seat belts and allow them to come out horizontally over the rear wheel arch, through a gap in the top corner of the rear bulkhead for the seats and clip into position. All the original mounting points for the OEM seats are being used in the vain hope that when its time for registration we shouldn’t have any dramas. Time will tell…. 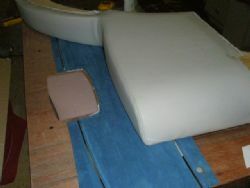 An integral part of the interior is the ability to be able to easily pull it apart should we need to. This has meant that all the components require easy access and a logical step by step way to get stuff out should the need arise. So far so good on this front and hopefully once it is in we won’t need to pull it out. We’ll check all the electricals, speakers and the like before the final install and hopefully Murphy’s Law will give us a break. Should be more to report in a week or so as it is coming together. Watch this space….